setting up gardens for butterflies, baiting for butterflies and butterfly quiz. 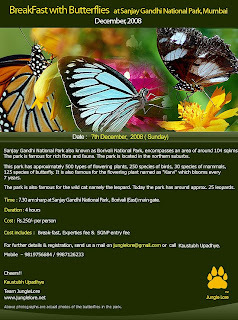 We would like to invite all nature loving & like minded people like you on Sunday, 7th December 2008 for a Butterflies & Nature Trail to Sanjay Gandhi National Park. We are sure that this wild experience would be a memorable one for both you and "Jungle Lore"
Sanjay Gandhi National Park also know as Borivali National Park encompasses an area of around 104 sq kms. The park is famous for rich flora and fauna. The park is located in the northern suburbs. This park has approximately 500 types of flowering plants, 250 species of birds, 30 species of mammals, 125 species of butterfly. It is also famous for the flowering plant named as "Karvi" which blooms every 7 years. The park is also famous for the wild cat namely the leopard. Today the park has around approx 25 leopards. Silonda is a restricted area of the forest. One needs to take a proper permission from the forest department before entering in it. It is a stretch of 3.5 kms (single way) for nature trail. During monsoon the road is muddy. One can trace the different color crabs & spiders in monsoon. During the trail one can see the Racket tailed Drongo, Red whiskered Bulbul, Barbet.. you can also hear the bird which sound like " will beat you..." and many more..You can also notice the Pagoda ants nest on the trees. In Silonda area one can find different types of medicinal herbs, species of birds and insects. Time : 7.30am sharp at Sanjay gandhi National Park main gate. Cost includes : Nature trail, Documentary on "Saving the Tiger", Breakfast, Expertise fees and SGNP entry fee.